I have the frame horns "straightened", painted, and the front end put back together. Thanks to Lew for letting me use his shop and tools. I cut some 11ga steel sheet for reinforcement after the heating and bending, recessed them in to the frame and welded to the front member and frame. I'll take it home soon and start working on the rear quarter panel, which means the green jeep that was yellow after it was green will be there! I'll join all my friends again this year and will contribute to the community's jeep first aid kit. Looking forward to some more gorgeous Colorado weather this fall. See you there! How does the schedule usually go early in the week? I was really trying to figure out how to get over there this year and then the women in my family reminded me that i need to be in St George on that Saturday (my Mom's birthday). How does the schedule go? On a daily basis, something like this: about 6am I get up to make sure the coffee pot is turned on. Then take a quick shower and get dressed for the day. Go get a cup of coffee and chat with the other folks who have come in for a morning shower. (2 of 3 showers open to guests). Grab some breakfast and another cup of coffee. Chat with the coffee lingerers until about 8am. Between 8 and 8:30 head for the shop to make sure it's open for anyone needing some morning maintenance. Swarm all around any jeep with it's hood up. Gotta see what the other guy's got! Make sure the oil's up, and the lug nuts are tight. ( ) About 8:55 we begin to line out along the driveway. Make sure every jeep has a driver and passenger. Water and lunches are packed. Radios are set to channel 3. Flip a coin to see if we go left or right out on the road. And head out for some high adventure! We'll be gone for most of the day, returning in the afternoon. If you are meaning from day to day what is the schedule, that varies from year to year. I'll put together a list of those roads I want to take the group on. With the smaller group early in the week I usually look at taking the rougher tougher roads. Then I go for easier smoother roads as the numbers of jeeps grow. I don't take any of our groups on Rubicon-style rock climbing routes. Just not my cup of tea. I have enough trouble (fun!) with my Blue Mule breaking down on these roads as it is! And if I need to change up the schedule to help someone achieve a ride to a favored location while they are here I can do that. I just need to know ahead of time. Even with the rougher tougher roads early in the week, we don't aim to break any jeeps and the routes can be driven by any stock CJ2A without damage if the driver is paying attention. 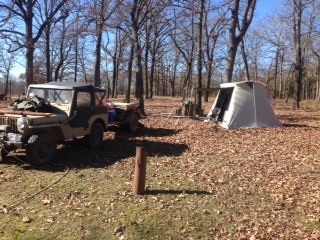 But every jeep on just about every road will get the 4WD tested. Whew!! That was a long winded answer for ya! I hope it helped. Thanks for the schedule. I noticed that jpet pulled in there Sunday night last year. I was thinking i might be able to do something like that and then head out Thursday or Friday, depending on whether i decided to come back here to Ogden before heading to St. George, or straight over to St. George from The Thirsty Dirt Ranch. I just don't want to show up there too early and be a bother to you and your family. The fact that you are kind enough to make your showers available really makes camping a much more pleasant prospect. Still not sure if I can work out the logistics of this, but I really want to. Not sure if everyone's nice jeeps will want to be seen with a rustbucket like Grampa's Jeep. Radios are set to channel 3. What kind of radio do you recommend? I may or may not have a 12v cig adapter by then. Mike is using FRF (Family Radio Frequency?) radios. There are usually a few extras around if you don't have one handy. I use both CB and FRS (Family Radio Service) radios. The CB's can really reach out so I like to have one in the back of the group to let me know if someone breaks down. But last year we did really well with the FRS radios, so I may just focus on them in the future. The FRS radios are the basic walkie talkies you can get from Walmart or Cabella's or online. What is nice about having the radios is that it allows us to pass information along while we're travelling. Things like wildlife sightings, rest stops, breakdowns, or simple questions all get handled in real time. Most of the FRS radios run on batteries. 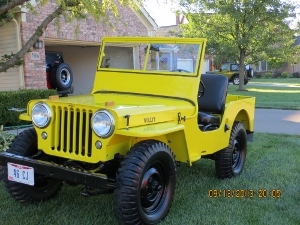 I hope to come but have a lot of work to do on my Willys to have it road trip worthy. I have enjoyed reading the posts from previous years. Looks like you guys all have a great time. man, I gotta figure out a way to be there, either this year or next year. I'm been through that area on a Harley, cant imagine how nice it would be off the beaten path in my 2a. This will be my first full year with it so I should be able to have any bugs worked out if there are any. The conversion to 12 volt has been a big improvement if for no other reason peace of mind. do I need or should I have a roll bar? I assume seat belts are a must? Tires, I have the military style set on it, change em tooooooooooooooo? I'm thinking that blue ridge parkway run will be a lot closer and certainly easier on big bird. Ok, a few questions. OK, a few answers. do I need or should I have a roll bar? NO. I assume seat belts are a must? No. winch? No. Tow strap nice to have. skid plates? Just one is enough. Tires, I have the military style set on it, change em tooooooooooooooo? Rotate the air and you'll be fine. I'm thinking that blue ridge parkway run will be a lot closer and certainly easier on big bird. Yup. thanks M38 Mike. what a great group here. I've done the Blue Ridge on my Harley and it was great and I have done 3 rides out west on the Harley hitting these states , South Dakota, Wyoming, Montana, Arizona, Colorado, Utah, and it was great. My Harley is fuel injected, how does the 2a handle the altitude changes since they are carbs? Ohio here with elevation range of 800 to 1200 msl. Those 3 trips out west on the Harley were all what I classify as "trip of a life time" rides and I am sure this tour would be just as great. Most likely not this year (you never know though) but a "must do ride". M38Mike, thanks for the response. greatly appreciate it. you're welcome. Hope to see you out here with us for the tours soon. How does a 2A with carb handle high elevations? They do great. I've taken the group up to 13,000 feet and every one made it on their own power. We shut them off for lunch break, and every one started back up without help. So don't mess with your carb, except to make sure it's clean inside. It'll do fine at high elevations. When you get to altitude, advancing the timing is helpful, you just don't want to go so far that the engine kicks back on starting. Then remember to put it back to spec when going back to Ohio. You do know that "sea level is for sissies". well, I'm sure Big Bird is more than capable of handling the tour. Pat T did a great restore of her. it's a little over 1400 miles one way, so two good days of towing. I've talked to my son to see if he wants to go and if not gonna check with a buddy. M38Mike, thanks for the invite. It's gonna take some planning and some schedule changes at work, but I cant see not making it out this year or next. what a fantastic opportunity. thanks. So don't mess with your carb, except to make sure it's clean inside.